A great chicken spaghetti recipe to try ! 1. Bring a large pot of lightly salted water to a boil. 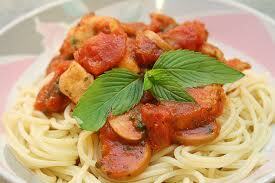 Add spaghetti pasta and cook for 8 to 10 minutes or until al dente; drain and return to pot. 2. To the spaghetti pasta add the diced tomatoes with green chile peppers, cream of chicken soup, processed cheese, chopped chicken, mushrooms, salt and pepper. Cook and stir over low heat until cheese is melted and mixture is heated through.The chicken spaghetti recipe is ready to serve..hot ! Enjoy it !